Campaign Worlds are procedurally generated -- meaning that a technology library is used to automate the process of creating each World’s map. Mountains, forests, rivers, castle ruins, abandoned villages – each World is different, which means the game of territorial conquest will be different in every Campaign. Campaign's will have different rulesets. Each campaign world exists for a set duration – typically 1 to 3 months -- or until some "win condition" is met. During that time, the World will cycle through a single in-game year: Spring, Summer, Fall, and Winter. Through the course of the Campaign, the Worlds grow more sinister and deadly as the land is consumed by the Hunger – an unstoppable legion of the undead. 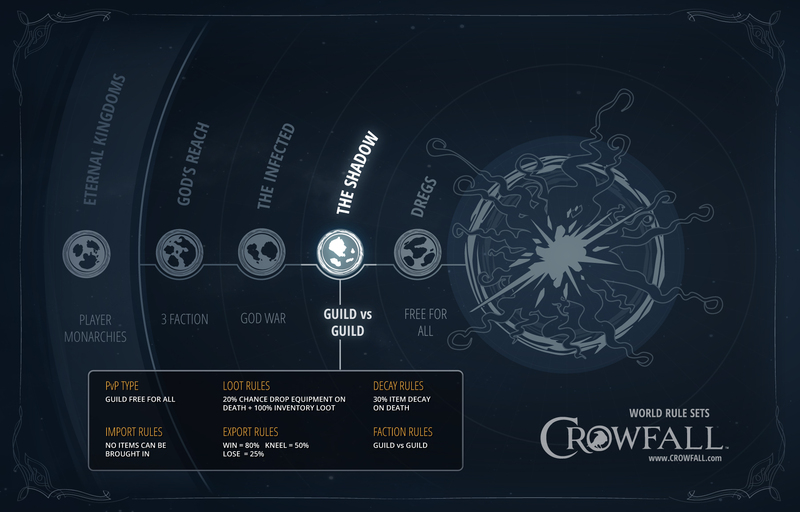 The Worlds of Crowfall are divided up into discrete zones, and each one circles around the Hunger. The closer a World is to the center, the greater the risk -- and the higher the reward! Each Campaign will be different. You (and your guild) can decide which style is right for you. If you change your mind, you can always try a different Campaign... with a fresh start, every time. These player-owned and player-managed kingdoms are the only permanent (non-time limited) Worlds. They are complete, functional Worlds - but lack resource factories (such as quarries, mines and mills) and produce only common reagents. Players rule these Home Worlds as Monarchs and can grant land and titles to other players in exchange for oaths of fealty. Levy taxes, enforce trade restrictions, and set the PvP rules within your domain. The proving grounds for Order, Balance, and Chaos. Players join one of three divine Factions and battle for control of the World. The goal for Order and Chaos is to capture as much territory as possible before the World is destroyed. The goal for Balance is to ensure there in no clear victor between Order and Chaos. These Worlds are more deadly and the stakes are higher. The alliances of the Gods hold no sway here. The followers of the twelve Gods vie individually for the Throne. The Shadow Worlds lie closer to the Hunger, where even the Gods dare not tread. 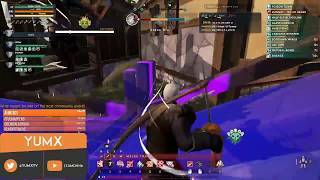 On these Worlds it's Guild vs Guild competition for the abundance of resources and rich cache of souls. On the razor-thin edge of the Hunger lies the Dregs... Worlds utterly drained of warmth, about to shatter into dust. Alliances between Guilds are weak and brittle. These every-man-for-himself Worlds are deadly and unforgiving - yet they yield the greatest reward for those who can survive. Map Size: How large is the world? Duration: How long does each season last? How long does the entire Campaign last? What triggers the end of the Campaign? Import/Export Rules: How much stuff can be brought in and out of the world, and when? Magic Level: How powerful are the different types of magic? Archetype Restrictions: Is this Campaign restricted to only certain archetypes? Death Penalties: When a player dies, do their items decay? If so, how much? What are the looting rules on death?